Chances are, when you’re looking to hire a wedding photographer, you’ll also be deciding whether or not you want to have engagement photographs taken. 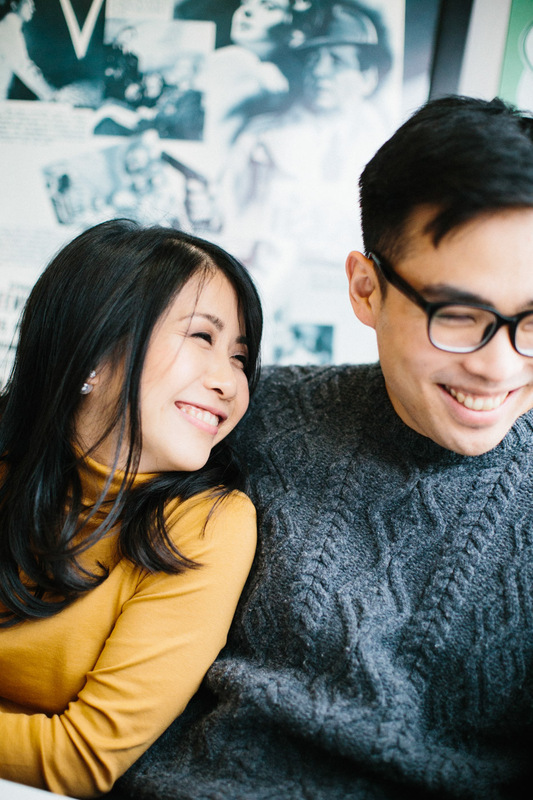 Aside from the obvious positives (you’ll have some nice new photographs for your guest book) and negatives (you/your fiancée hates having their photograph taken), one reason I advise couples to take advantage of the engagement session option is that it’s a great chance to spend some time getting to know your photographer. As a wedding photographer I’ll likely be spending the full day with you on your wedding day, and am there throughout some of the most important, private, and intimate moments. It’s important that everybody feel comfortable, and engagement sessions are a way to get to know who you are together, how you like to interact, what your sense of humour is like, and all the other little details that will help me do the best possible job on your actual wedding day. 1. Pick an activity or location that’s comfortable to you. The point of the engagement session is to spend some time getting to know each other, and capturing great photographs of you and your fiancée having fun together. It’s basically a photographer date, and the images we create along the way should really resonate with who you are together at this point in your lives. The activities you choose can be anything that you enjoy together, maybe this means starting the session off at your favourite Saturday morning café for lattes and croissants; or if a nice glass of wine is more your thing, let’s skip the coffee and head to the best wine bar in the neighbourhood where you had your first date together. It can be as active as going surfing (any surfers out there looking for a wedding photographer? ), or as quiet as making Sunday morning brunch together in your apartment and snuggling in with a book and your cats. If you’re at all unsure about an activity or are having trouble coming up with ideas, feel free to ask your photographer for a quick engagement session brainstorm! If you’re having trouble picturing your favourite activities together as ‘photo-shoot-worthy’, start making a list either together or with your photographer of ways you can jazz it up but still feel like you! Perhaps nothing makes you happier than a Friday night movie or Netflix marathon; turn it into a drive-in movie date instead, complete with a sunset Frisbee game before the movie starts, a trip to the confectionary to load up on popcorn and twizzlers, and pyjamas and duvets in the back of your car with the hatch open. Maybe Sunday brunch is your ritual but you’re not in love with the dark apartment you’re currently renting, let’s start the day with a trip to the farmers market to buy ingredients together, make an easy brunch on your biggest cutting board, and enjoy it out on your balcony or with candles lit around the table. The goal is to tell the story of who you are, and everybody has a photo-worthy story. 3. Make it into a date. 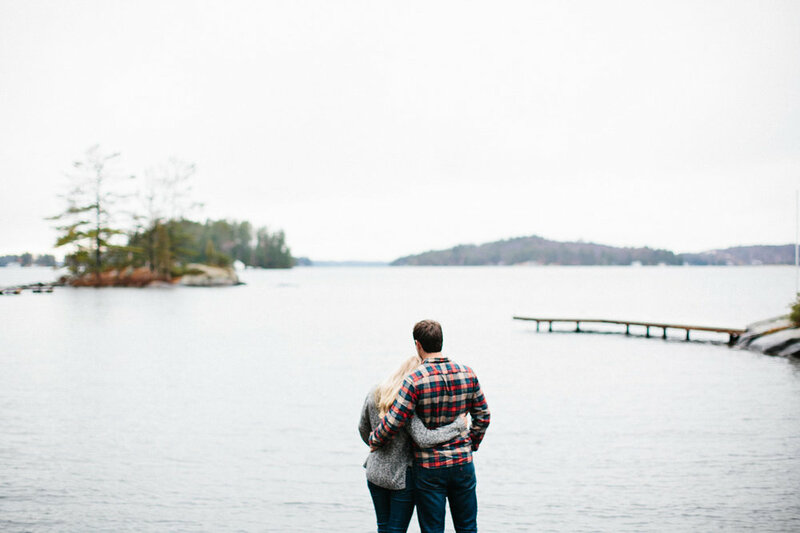 Treat your engagement session like a date and put yourself into the mindset to relax, have fun, and feel more romantic than your average Tuesday. Take the afternoon off together to do something fun before your engagement session, spend some time getting dressed up without the rush and stress of having to be somewhere quickly after work. Maybe finish the evening off by making reservations for a later dinner post photo-shoot at that restaurant you’ve been wanting to try for ages. Turning your shoot into an experience will make it something to look forward to, and something to remember as that great date night you actually made time to plan together. ‘What do I wear’ is one of the most common questions I'm asked before an engagement shoot. There are so many options it’s hard to come up with an easy overall answer! The best advice I can offer is to dress comfortably for yourself, while also keeping in mind your chosen engagement session activities. If you’ve decided to go hiking in the fall, wear your favorite hiking outfit complete with big woolly sweaters and your well worn hiking boots with the red laces. If cocktail hour at the classy bar downtown is your thing, maybe it’s a good chance to pull out that silky dress you bought for a Christmas party and haven’t worn yet. If you’re at all unsure about a chosen outfit, pattern, or colour, you can always ask your photographer. The final piece of outfit advice I can offer is to dress to the same level. Try to style yourselves together as a couple, rather than picking your outfits separately and hoping they work together. I don’t mean matching white turtlenecks 90’s style, but if you’re planning on dressing for a nice night out together, avoid the couple combo of high heels and hockey jerseys. Unless that’s really your thing, you do you. Very few people come into their engagement sessions with hours of childhood modeling experience for the Sears catalogue in their back pocket, and having your photo taken together can be daunting. It’s easiest to have something to do that you enjoy. Talk, laugh, be weird when you’re feeling weird, high five if you’re high fivers, and throughout your session help your photographer get to know who you are as a couple. 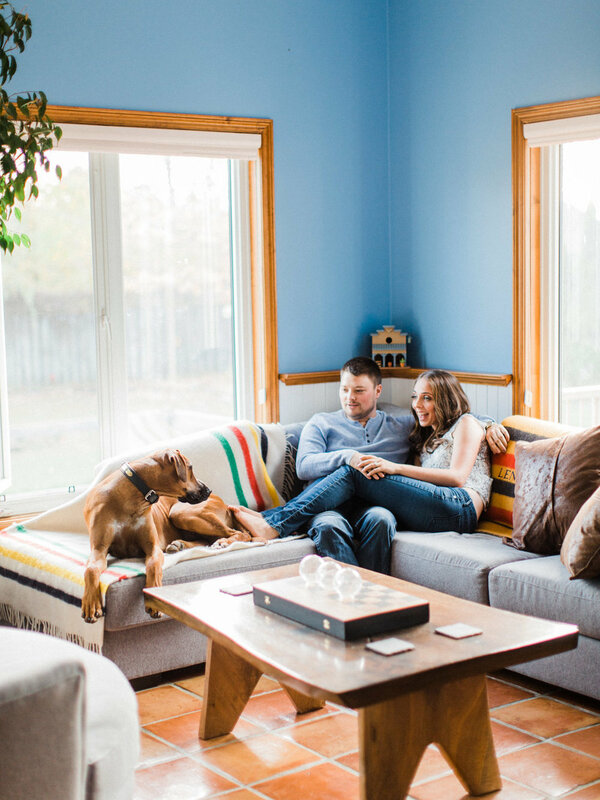 If you’re set up to cuddle on the couch, but really you’re much more loving when making sarcastic jokes while sipping your coffee in separate chairs, then tell your photographer that you’re not really couch snugglers. This is a practice session for the wedding day, so if you never exchange forehead kisses, don’t let us take tonnes of forehead kissing photographs on your engagement session and wedding day, these will never be your favorite shots. Seriously. We’ve already established that having your photo taken can feel awkward, so if you’re feeling weird then let it show! 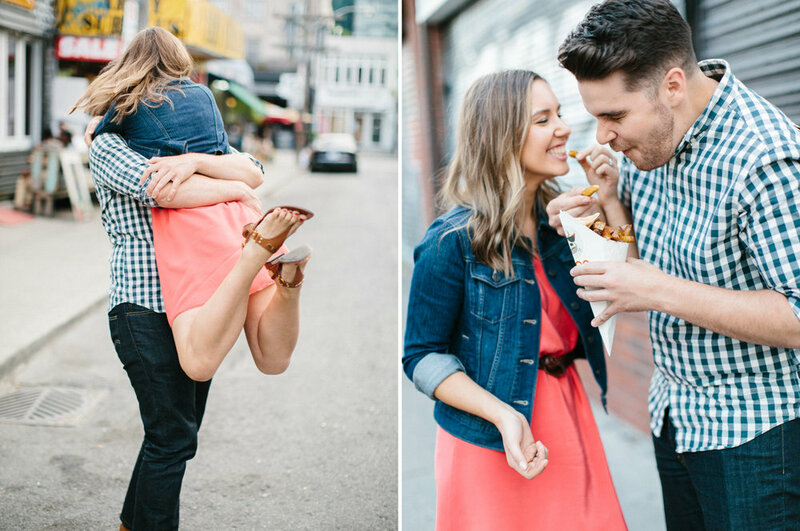 Don’t be afraid to be silly, and trust that your photographer will capture the best photographs that represent you together. If you think you’re trying to gaze lovingly at each other while the sun is setting, but are just barely stifling a laugh, let it out! Snort if you have to. Chances are you’ll appreciate the photo of you two howling with laughter together at your inside jokes more than any cinematic romantic sunset shot down the road anyways. This might be a more location-specific suggestion, but make sure that the activity you’ve planned and the locations you’ve chosen fit well with the weather. A little bit of rain never hurt anybody while taking photographs, but if you really want to wear that beautiful long dress you love, try to wait until it’s warm enough to wear it rather than dashing back and forth between putting your coat on to warm up. If you’re keen on a winter engagement session, plan indoor breaks to warm up again so you don’t end up with a pink nose in all your photographs, wearing a miserable expression as you lose feeling in your fingers. Remember, this is supposed to be fun! 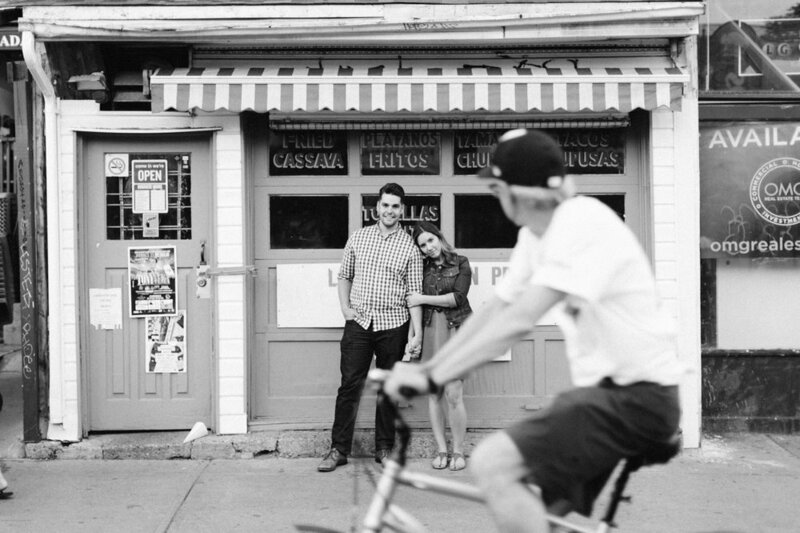 Keeping in touch with your photographer about your engagement session plans is key. Ask for ideas if you’re having trouble thinking of something fun to do, talk about the best time of day to take photographs for what your planning, and toss ideas around to find the right outfits together. It’s all about getting to know you, so the more conversations we get to have the better! Also, keeping your photographer updated on the locations you want to visit is important to make sure you have the right permits, call ahead to make sure it’s okay to take photographs at that time of day, and generally make sure there are no unwanted photography surprises messing with your plans.